Recommend written by mobile The product packaging is in full shipment. Delivery is about 10 days I will come to the packaging. Delivery is about 10 days I will come to the packaging. Highly Recommend written by mobile Delivery is also very fast and very satisfied. There is also a repurchase order if necessary. Delivery is also very fast and very satisfied. There is also a repurchase order if necessary. I do not want to use the humidifier separately. Highly Recommend written by mobile The delivery is also perfect and the product specifications are also good. The shipment was also much faster than I thought, and I put it on the hearing aid in my home, so I used the space and the design. The price was originally expensive, but I think I bought it more cheaply than others. That's good. 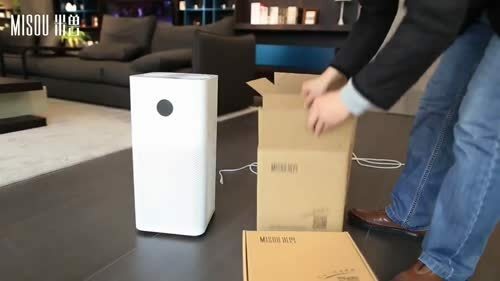 The air purifier has become bigger and bigger. It is really quiet and easy to use. It is highly recommended. Fast shipping and nice packaging. And I didn’t expect there’s 2 vaporizer. Also include wheels are good. Thank you! Better than expected. It hooks on too tight to the existing grill that I am afraid it may break over time. Othe than that pretty good overall. I use a US Air Pro with a humidifier header, which is a space saver, so I purchased an additional header for US Air 2. Hi. I bought it last time and I'm writing it well. What is the frequency of the humidifier filter replacement? Yes. The humidifier filter is 3-6 months. Antibacterial is one year left and right. How many additional product filters do you have? Yes. The price of the filter is one price. Is there any CMIT or MIT ingredient in the filter or antibacterial ball component? Our filter is pure natural vegetable fiber and absorbent. The antibacterial balls are mixed with rare earth materials and catalyst materials in mineral materials. It has a sterilizing effect and has a strong adsorption ability. It exchanges with Chinese ion in the water to double purify. I am going to buy a humidifier head for Pro. I wonder how many filters are included by default. Yes. Humidifier comes with two filters and a humidifier filter net when you purchase. The purifier action button is on the upper side, and the purifier button is pressed through the humidifier. So ...... 1. How do I turn only the purifier? 2. How do I turn only the humidifier? 3. Should I always work together? Use with a purifier and a humidifier. To turn only the purifier, remove the humidifier. What are you talking about? It's an unregistered waybill. Did you come to Korea? Come on. You have no sense? The products are now customs clear, so we can not look up the shipping number. When customs clearance is complete, it is viewable.